WHY OWN A FISH O LICIOUS FRANCHISE? The benefits of owning a Fish-O-Licious food franchise are many. We offer gourmet quality food. (That’s our pedigree.) We use only the freshest seafood prepared on site daily. We make all our own special gourmet sauces and dressings along with everything else on site daily. You can see our quality displayed right in front of you! We serve elegantly prepared generous portions at far below competitor pricing. It’s easy to see why our lines are longer than anyone else around. becomes apparent immediately. It’s our “make it personal” approach. We know our business, the market and how to excel. This means you can avoid expensive start-up mistakes. You’ll be taught in detail everything you need to know to start and run your business. We are there with you before, during and after you open your doors. Professionally prepared and well-tested advertising can give you a huge advantage in a competitive market. We know how to bring people in the door! [if necessary] and everything you need to get your food franchise open quickly. concentrate on the activities that will make you the most money. like-minded people in our franchisee family. You’ll make friendships that will last a lifetime. 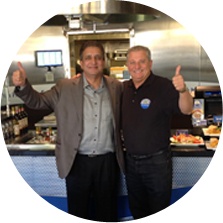 Fish-O-Licious is an exciting franchise opportunity with a great concept. It offers fresh healthy alternatives to fast food and gets the community involved. * This information is not intended as an offer to sell, or the solicitation of an offer to buy, a franchise. It is for information purposes only. Currently, we are only offering franchising opportunities in California, which regulates the offer and sale of franchises. If you are a resident of California, we will not offer you a franchise unless and until we have complied with applicable pre sale registration and disclosure requirements in your jurisdiction.